Most playdough recipes are cooked, and here is one example. There are playdough recipes that you don’t have to cook also, like our No cook playdough recipe, you should try several of our playdough recipes in order to find your favorite. Add the food coloring to the water. Cook slowly on medium to high heat and stir until the playdough thickens. Keep the finished playdough in the fridge in a plastic container, that way it lasts longer. This playdough recipe takes less than 10 minutes to make and is super simple. 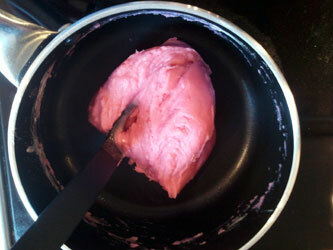 Yes, you have to cook this playdough, but it’s really very simple and if I can manage it, so can you! We begin with collecting the needed ingredients. 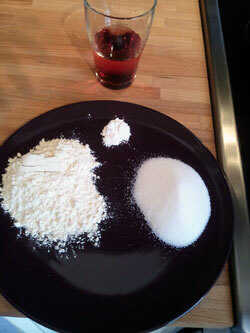 We have the flour, salt, cream of tartar, water, oil and food coloring. I’ve actually mixed the water, food coloring and oil already. Mix all the ingredients together in a pan. It will hopefully look something like this. 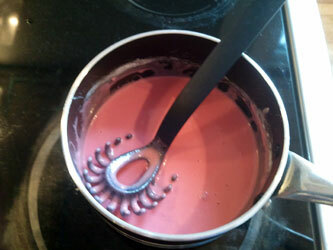 Start heating the mixture on medium heat, while stiring. After 2-3 minutes the texture will start to change and it’s getting more firm. From this point we will have the finished homemade playdough in about 2 minutes. When it looks like this, it’s all done. You can remove it from the pan. Remember that the playdough is still hot, so don’t burn your hands. 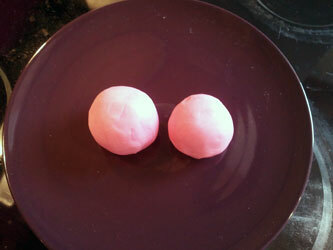 If your playdough is really lumpy and dry at this stage, add a bit more water. If it’s too wet, try boiling it a bit more or add more flour/salt. My finished playdough looked like this. You can add more or less food coloring or maybe a different color, your choice. Good luck with this playdough recipe! I just made this for my kids and it worked out very nicely. I made white dough so that I could split it and add different colours later. I didn’t use all of the water, figuring that I could add more if it went wrong but I didn’t need to. It was very hard to mix at the end, but was too sticky to call ‘done’. After a bit longer I decided to get the texture right through kneading. 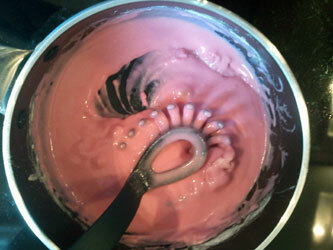 I floured my surface (to absorb excess stickiness) and added colour while I kneaded. Very satisfying and tactile – you can really feel when it’s ready. Also added a ton of glitter. Can’t wait for my little one to wake up! Great work! The glitter is definately a nice touch, I might even have to add a glittery playdough recipe! Just wait though, when your child gets a little bit older it gets even better, since you can make the playdough together! I just made another batch (make it all the time!) and it occurred to me to share a tip I discovered! When it begins to get a little stiff, slather 2 or 3 pumps of hand lotion on your hands (dont rub it in) and knead it into the dough. PERFECT! AND SO MUCH LESS DISGUSTING THAN ADDING WATER! The hand lotion is a good idea, but it then makes the completely non-toxic playdough potentially toxic, which is not a great idea if young children are going to be playing with it. My 3 yr. old grandson and I made this 2/4/12 when he came over for a sleepover. It was so simple to make. We made green but after it was done we added several drops of different food colors and gently kneaded the dough giving us swirls of different colors in our dough. We got out my cookie cutters and rolling pin and he played for hours. He was so proud of himself for making his own playdough. Thanks for a great rainy day activity! I made this last night and my son and i played with it for some time and then put it in an airtight leftover container. when he got home from school today it was all soft and sticky it was not play dough texture anymore. i threw it away cause i did not know if i did something wrong and did not have time to redo it nor had the ingredients. DID I DO SOMETHING WRONG? oh and i did not use the cream of tater. The cream of tartar is actually quite important. It does something to the texture of the playdough. Try using it next time, it will probably make the difference. Sure, it will last longer if you do. But it’s more important to keep airtight. I used to make this recipe all the time with my preschool class. We made it in an old electric skillet table in the classroom. The kids loved helping make the dough almost as much as playing with it and with the electric skillet set up nobody was working at a stove. You can pick them up at thrift stores and yard sales pretty cheap too. Cool, thank you for the tip! I have made this cooked playdough many times. It always tunrs out great. If it is sticky I too knead it with more flour. I find if you cook it too short that’s when it gets too sticky. Another trick is (if preparing ahead) wrap it in plastic wrap to let it slowy cool down and play with it later. I find this helps keep it longer for some reason. Very nice recipes, I love how many you’ve collected. Thank you! Loved the recipe. It’s foolproof. Used it for a math demo. You roll it into a perfect sphere to match the size of a wide short clear cylinders top or bottom. When kids see it’s the same diameter as the cylinder and then you push the sphere down into the cylinder, and squish the sphere down to fill the cylinder, it fills exactly 2/3 of the cylinder. This proves that a sphere with the same diameter as the cylinder is 2/3 the volume of the cylinder. It’s cleaner, and simpler than using water displacement to show the sphere is 2/3 the volume of a cylinder. It paints a visual picture for them of the relationship. Great recipe and so quick. I made it this morning at 06:30 to take to school. I made mine with half plain and half whole grain flour. No colouring but I like to add Mixed Spice. The kids love the texture and the smell!